U.S. District Judge Robert Lasnik says he’s frustrated “political branches” haven’t resolved the issue, leaving his court to rule. A federal judge in Seattle said he’ll decide by Monday whether to issue an injunction blocking a Texas man from publishing downloadable blueprints for producing 3D-printable guns, after lawyers argued the case before him early Tuesday. But whatever U.S. District Court Judge Robert Lasnik decides, he made it clear before retiring into chambers Tuesday that he doesn’t believe his court is the proper venue to resolve the issue. Lasnik’s ruling will determine whether to make permanent a restraining order he issued last month that temporarily stopped Cody Wilson, a self-described “crypto-anarchist” and gun-rights advocate based in Austin, Texas, from publishing online plans for printing the plastic guns while a lawsuit over the matter is resolved. Lasnik issued the temporary order July 31 — in what on Tuesday he called “probably the most significant case that I’ve handled as a United States District Court judge” — a day after Washington State Attorney General Bob Ferguson sued the Trump administration over the issue on behalf of multiple states. Nineteen states along with the District of Columbia are part of the suit, contending the federal government’s decision to drop its own five-year litigation against Wilson and allow his company to post the blueprints would provide broad unregulated access to dangerous weapons. The U.S. State Department had fought in court since 2013 to prevent Wilson’s nonprofit firm, Defense Distributed, from distributing the blueprints online, contending doing so violated a federal law known as the International Traffic in Arms Regulation (ITAR). But in April, the federal agency reversed course, agreeing to a settlement that would have allowed Wilson’s firm to disseminate the plans. Before Lasnik on Tuesday, Assistant Washington Attorney General Jeff Rupert cited various sworn declarations from experts and existing case law in his arguments that the federal government’s actions allowing Wilson to readily distribute the plans creates “irreparable harm” and raises public-safety concerns by potentially giving terrorists and other criminals access to undetectable and untraceable firearms. Because the guns are plastic, they “wouldn’t be picked up by metal detectors” at airports, courts, government buildings or even schools, Rupert said, and law-enforcement authorities are unable to trace them through ballistics and other forensics to crimes. “It will be more dangerous for the public and for the police officers whose job it is to protect the public,” said Rupert, referencing a declaration on the issue from Seattle Police Chief Carmen Best. Rupert also contended the federal government didn’t give Congress a required 30 days’ notice when modifying the U.S. Munitions List under ITAR and creating a special exemption that allows Defense Distributed to begin publishing 3D gun files. Steven Myers, the lawyer representing the U.S. government, countered the revisions made to the federal munitions list were technical in scope and didn’t require congressional notice. 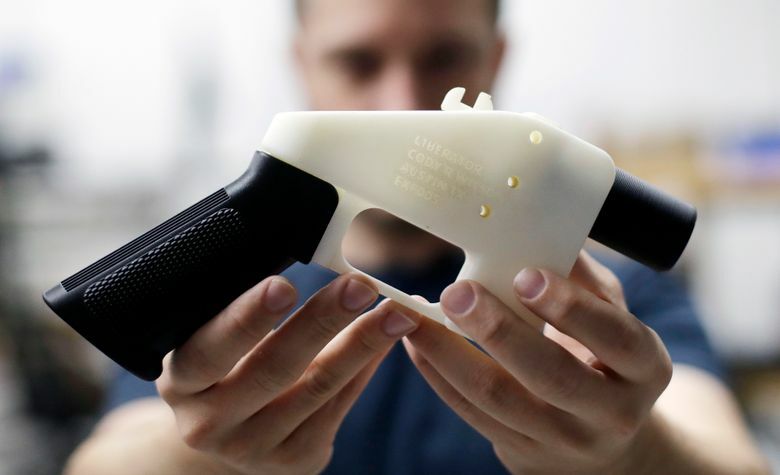 He added the injunction isn’t needed because other laws already outlaw the manufacture and possession of such 3D-printable guns, which the government is “committed to vigorously enforcing,” he said. The legal dispute before the court centers on ITAR, a law that involves regulating the export of certain weapons — not the potential dangers that may result if criminals print out guns and later use them to commit offenses. “My client could mail the files at issue to everyone in the country and violate no law,” Flores said. Rupert countered such a “cat-out-of-the box argument” doesn’t address what would be a far more widespread and immediate availability of such blueprints to the public. “It’s one thing to have them out there on the far reaches of the internet, it’s another thing to have them out there and widely available for anyone to find,” he said. Shortly after Lasnik issued the temporary order last month, President Donald Trump, a staunch supporter of gun rights who has called himself the best friend of the National Rifle Association (NRA), tweeted that he is “looking into” his administration’s decision to clear the way for Wilson’s actions. “Already spoke to NRA, doesn’t seem to make much sense!” his tweet added. Senate Democrats quickly declared that Trump would be responsible for any injuries or deaths resulting from 3D-plastic guns, and called on him to reverse the policy immediately. On Tuesday, when Lasnik asked Myers whether the administration, in fact, had reviewed the State Department’s decision on the issue after the temporary order was issued last month, Myers said he could not say, noting only that the federal government’s position remains unchanged. Lasnik said he may issue a ruling in the case as early as Friday, but no later than Monday, the day before the temporary restraining order expires. Joining Washington in the lawsuit are Connecticut, Maryland, New Jersey, New York, Oregon, California, Colorado, Delaware, Hawaii, Illinois, Iowa, Minnesota, North Carolina, Rhode Island, Vermont, Virginia, Massachusetts, Pennsylvania and the District of Columbia.